Nic Sheff's memoir Tweak came out at the same time as that by his father David, Beautiful Boy. David Sheff details the terrible anxiety of being a parent as his son comes close to killing himself with drugs, and he realizes his son has no compunction in lying and stealing from the family. The father's story is about questioning what he did wrong in raising his son and working out what he can do to help his son who he cannot trust yet protect the rest of his family. Nic Sheff's story is about his experience taking drugs, getting treatment, then going back to drugs, and his final redemption. Tweak is notable for three main reasons. First, it is unusual to have parallel memoirs by a father and son, and this provides a valuable comparison. 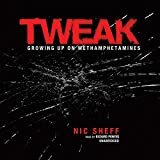 Second, this memoir is so full of explanation of why Sheff did it and how he feels about it now, it is a rich resource to discuss the moral side of drug addiction. Sheff has gone through multiple rehabilitation programs and has been part of AA and recovery programs for years, and he adopts much of the rhetoric of that treatment, yet he is also often suspicious of it, especially in its talk of God or a higher power. It's an interesting combination of explanations and reflections. Third, his story is complicated by the fact that at the age of 22, he received an extra diagnosis of mixed-state rapid-cycling bipolar disorder, and that complicates our understanding of his behavior. Sheff's writing style is conversational, often including expressions such "a bunch of it," "sort of," "kind of," and slang. He starts his story (Day 1) in his early twenties at the start of one of his relapses, when he goes seeking out crystal meth and runs into an old girlfriend who had also been clean for a while, but who decides to join him in his relapse. He proceeds to tell his story both forwards and backwards, leading to his final rehab and talking about his childhood and teenage years. His descriptions of his experience are vivid and it is an easy book to read. The unabridged audiobook read by Paul Michael Garcia is produced well and the performance is compelling, with the different characters done in quite different voices. Nic Sheff comes from a privileged background; his stepmother is an artist, and his father is a writer who writes for national magazines. The family lives in San Francisco and has another house in the countryside. The family is well-connected, knowing many people in journalism and the art world. The main dark spot in his youth was the breakup of his parents' marriage when he was a little boy, and the subsequent experience of shuttling between his father's home in San Francisco and his mother's in Los Angeles. Most children experience family turmoil these days, so that certainly is not enough to explain why Sheff took so readily to drugs. He offers many explanations of his own. He loved drugs, especially crystal meth, they allowed him to push away his feelings of alienation and difference, he could not stop himself, and he needed to go through the experience of relapse. He does not say much about his bipolar disorder, although he does say that the medications he takes for it help him remain emotionally stable. He also finds AA and especially his AA sponsor very helpful. The final rehab program he stays in for four months, which uses a wide range of different approaches, including some that seem quite new age and non-traditional, seems to work well for him. Tweak powerfully raises the question of the moral aspect of addiction, especially when read in combination with Beautiful Boy. Nic Sheff stole checks from his parents, stole money, raided his little brother's piggy bank, and even stole his little sister's diary. He also encourages other people to relapse and becomes hated by their families. He says that the drugs took away his values and he no longer cared about his family. Of course, later on he felt profound regret for his actions, and he expresses his regret very often during his periods of being clean. The emotional culmination of the novel is an episode in his art therapy where he writes "I'm so sorry" hundreds of times, and this helps a little in repairing the damage in his relationship with his father. All through the book, one is faced with the question of how accountable Sheff is for his hurtful actions. Should we see his condition as just a biomedical impairment, for which Sheff is not responsible and so he is not really morally responsible for his hurtful actions? Or alternatively should we see the addiction as making him a immoral monster, ready to betray his family with no real regret at the time? Do his family have a right to his apology and reparations for his actions? Do they have any obligation to forgive him? Of course, there is plenty of anger and resentment on both sides, and it may be therapeutically useful for people to express their emotions and achieve reconciliation after, but the question of what is therapeutically useful is different from that of what moral duties people have. Sheff himself puts his behavior in a moral light, and this seems to work for him. His book will be a helpful resource for others who are grappling with similar questsions.